When we buy those plastic bottles of cleaning product, we are really paying for large amounts of water. This also comes at a higher cost for the planet because of the greenhouses gases emitted during transport. Those bottles have virtually looked the same since they were introduced in the 1960s. Fifty years later, don’t you think we should have come up with a smarter, better way to do this? Well, we have, as two clever companies are demonstrating with their new product lines. 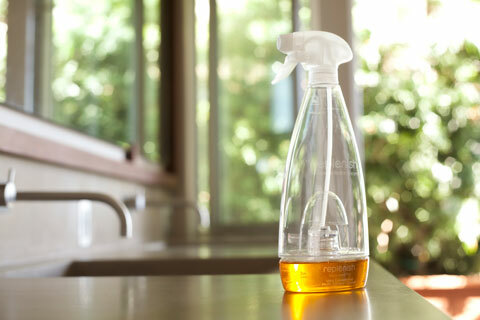 Replenish is one company that is looking to transform the way we buy and consume cleaning products. Yesterday [October 19, 2010], Replenish unveiled its new flagship product: “a patented, Reusable Concentrate Mixing and Delivery System designed to transform the way household cleaners are packaged and consumed.” Their new bottle, designed in collaboration with McDonough Braungart Design Chemistry (MBDC), is not only reusable but is also made of 100% recyclable materials. The design is based on the use of replaceable Concentrate Pods, each of which makes four bottles (64 diluted ounces) of powerful, guilt-free cleaner. You flip the Pod on, turn the bottle, squeeze until the measuring cup is full and finally add tap water. There’s no messy pouring and you only have to replace the Pods every fourth time the bottle runs out (for me, that would be about two years). “Creating a whole new manufacturing approach has been quite a journey but I am excited that we were able to build and supply the product in a 200 mile radius in Wisconsin,” says Jason Foster, Founder and CEO of Replenish. Each smartly designed Concentrate Pod makes four bottles worth of multi-surface cleaner. Just flip and add tap water. The best thing about Replenish is that you only purchase what you need. No more waste for unnecessary components (water) and materials (plastic). According to the company, mixing Replenish Concentrate Pods at home reduces the amount of plastic, energy and CO2 emissions by 90% compared to pre-mixed cleaners. What’s in the bottle is also good news — natural, sustainable ingredients that are non-toxic to aquatic life, readily biodegradable and PH Neutral. Safe for you, your home and the planet — triple whammy. Replenish’s high-tech green chemistry also reduces the amount of cleaner needed to rinse away soils by more than 50 percent. Did I mention it saves you money too? Judging by the fact that the company’s entire stock sold out in the first 24 hours, I’m going to venture a guess that Replenish cleaners will be quite a hit with consumers. Get more shine for your buck, and be good to the planet too. 60 billion (yes, Billion, with a B) pounds of plastic discarded annually, and only seven percent of that is actually recycled. Whenever you see “recyclable” printed on a package, your greenwash radar should go off. Anything can be recycled, the questions is if it actually IS (and remember, Reduce and Reuse come before Recycle). Innovative companies like Replenish, who actually attack the root of the problem (there’s too much plastic out there! ), helps keep delivery trucks off the roads and bottles out of landfills. 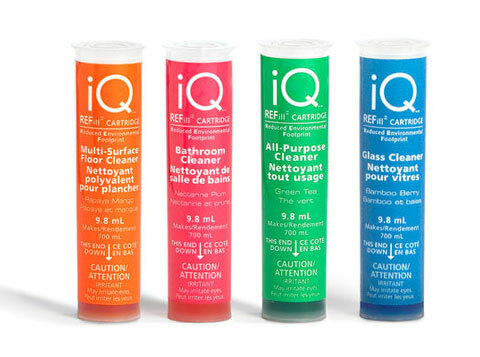 iQ REFill cartridges contains all the cleaning power you need, in a tiny package that’s easy to ship. Just add tap water. 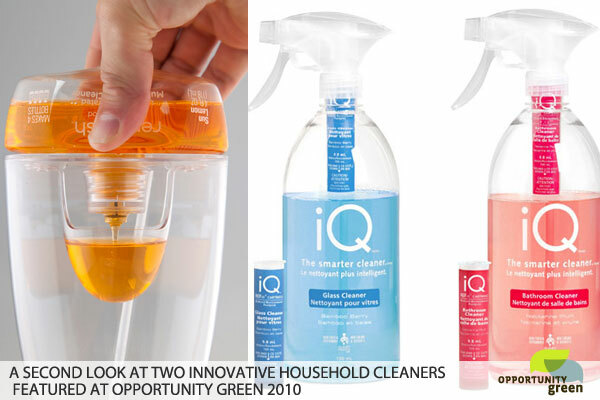 Another company aiming to change the way we buy and use cleaning products is iQ, who was a finalist in Opportunity Green‘s OG25 Product Design competition last month. Their system is also based on reusing bottles and eliminating the need to transport water. 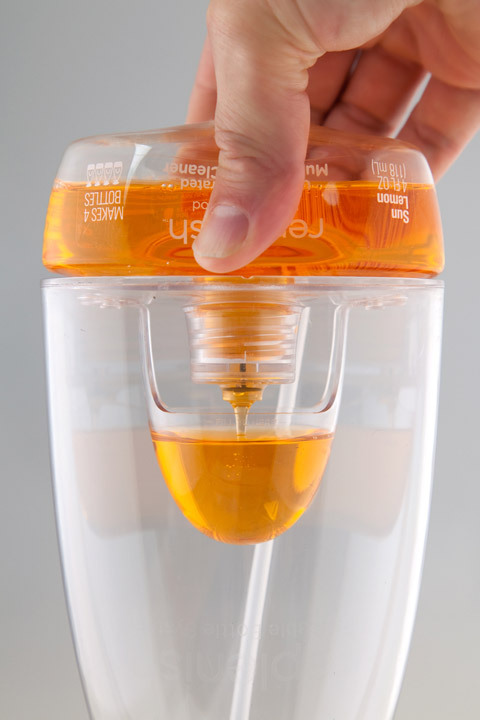 The iQ REFill (REFill stands for Reduced Environmental Footprint) is a tiny cartridge that contains all the cleaning ingredients. 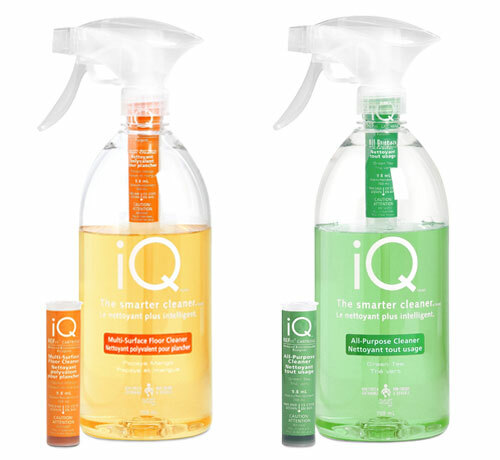 The idea is simple, fill the specially-designed, multi-use iQ spray bottle to the fill line with regular tap water, add the REFill cartridge and twist on the sprayer head to release the cleaning concentrate from the REFill. No measuring, no waste and no unnecessary waste created. 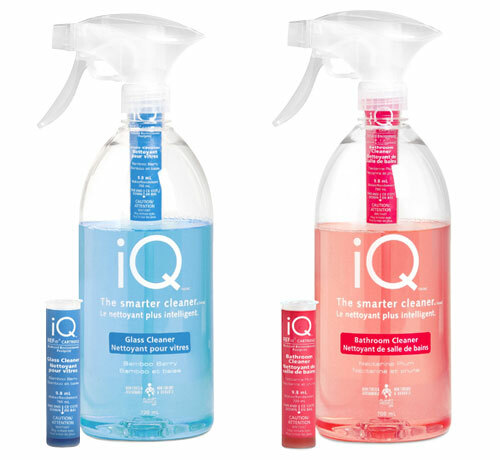 The iQ cleaning system features four solutions: All-Purpose Cleaner, Bathroom Cleaner, Glass Cleaner and Multi-Surface Floor Cleaner, all of which can currently be found at Hannaford and Sweetbay Supermarket. No measuring. No mess. No waste. It’s time to clean up your cleaning routine! Of course, you can always make your own cleaners as well. This post is part of an ongoing series in collaboration with Opportunity Green, highlighting innovations in sustainable design and business. I adore both of these great products (and Goodlifer too) and learned about all three of them at Opportunity Green!! Awesome website.I wanted to thank you for this great read!! I definitely enjoying every little bit of it I have you bookmarked to check out new stuff you post. This is really interesting and fantastic to read and i must appreciate you for sharing this post with all of us.